The first office I visited was the Waterbury location. In my past experiences, every office I’ve visited has had a line of people waiting to be taken care of trailing out of the front door. Much to my relief I didn’t see a single soul idling outside the building, but unfortunately walked in to see that all chairs were occupied, causing large groups to gather on each side of the entrance… (AKA make sure to wear comfortable footwear because you never know what seating availability will be like, let alone how long you’ll be there.) Also, keep in mind that there is a gun range next to the office (it can be pretty unnerving to hear if you aren't expecting it). Aside from all the forms you need to get your learner's permit, driver's license, etc., grabbing a transaction ticket is the most important thing to remember. Regardless of what you’re there for, you’ll need one. Consider it one of Willy Wonka’s Golden Tickets for the day; do whatever you have to not to lose track of that thing. If you do, sadly, you’re out of luck, and it’s back to square one. This is because employees use them to make sure you’re receiving the right service and to assure each customer is being assisted in a fair and timely manner… As fair and as timely as it can be there, anyways. So when you get to the Waterbury office, head straight into the main entrance, bank a right once you’re inside, and head towards the giant sign that reads ‘Information’. There, they’ll make sure you have all the correct paperwork and forms so neither their nor your time is wasted. If you’re there for a scheduled permit or licensing road test, head back towards the entrance with your ‘golden ticket’ & you should see another, smaller sign that reads ‘Road Testing Window’. There are two lines: one for permit appointments and one for road testing appointments. Wait in either accordingly. And no, the bolded print is not a typo, so take heed! Each type of testing is made available by appointment only. If you’re applying for your permit, you may only do so online. It costs $60 to apply for and must be paid for at the time of scheduling with a valid credit card. Be sure to keep track of the date and time of your DMV appointment! They’re inconvenient to schedule in the first place, so don’t set yourself up for failure or set yourself back another two months by missing it… Not to mention that you’ll have to pay the fee again. Once you’ve had your permit for over 180 days (or 120 depending on your specific driver training) you’re finally eligible for your license! Keep in mind that this appointment can only be made in person or over the phone. If you’re testing in a vehicle of your own, be positive that it’ll pass inspection; we’ll cover more of that at a later date. Be pro-active and check appointment availability at the location you’re hoping to test at about a month or so before you’re ready… There’s usually a hefty wait time and the point of all of this is to save you as much time as possible. So again, make the date and time of your appointment easily remembered; write it down on the family calendar or set a reminder with an alarm on your phone. Be sure to leave home with all needed forms and enough time to arrive at the office safe & sound. Make sure to call or check online well before an appointment is needed so you can get one that works with your schedule and the DMV's. Before you head to the office, double check that you have all needed forms & paperwork. It may sound silly, but be sure you’re waiting in the correct line! Stay attentive; your name or the number on your transaction ticket could be called at any time. Head to the DMV with the expectation that you’ll be there for, at the very least, a couple of hours. You’ll be pleasantly surprised if it doesn’t prove to be true! 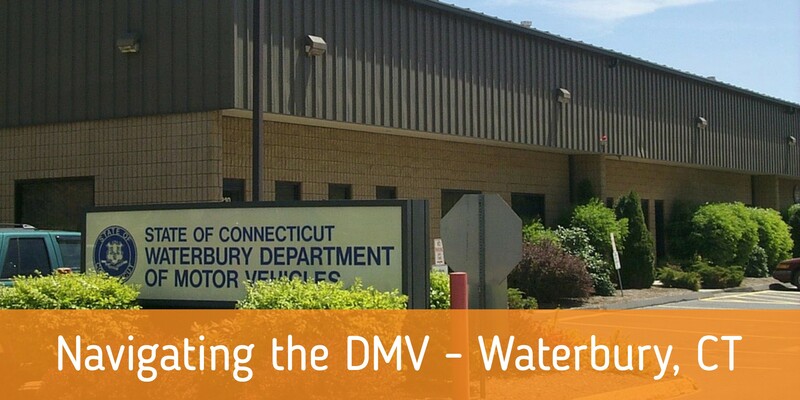 Wishing you nothing but the best, and of course a hassle free visit to the Waterbury DMV, your friends at The Next Street! Need help getting your permit? Download our FREE Permit Prep eBook today!